Marouane Fellaini's exit from Manchester United should be the start of a revamp in the club's current squad. Manchester United are the biggest football club in the world. There should never be any room for mediocrity. Given the bulk of finances and limitless resources at the football club, at no point should the squad’s quality ever deteriorate or be compromised. It is fair to say that Man United’s recruitment since Sir Alex Ferguson’s retirement has been hit and miss, as, despite the arrival of some big star names, only a handful of players have truly shown their worth at the club. One player that has divided fan’s opinion on this matter has been Marouane Fellaini. Although the Belgian has provided his useful services in pivotal stages of games in the past, fans have failed to accept Fellaini’s style of play and image on the field. Whatever your opinion may be of the midfielder, it looks as though he is destined to leave Old Trafford and join Shandong Luneng. BBC Sport has reported that Fellaini has already agreed personal terms with the Chinese club, with their transfer window closing on 28th February. The news received mixed responses from fans, with some celebrating his departure and others seeing the move as a poor piece of business from Ed Woodward. Despite the different reactions, this should be the start of a small transfer revamp at the club. Footballing philosophy finally in play? Since Sir Alex Ferguson’s retirement, United have lacked a real football identity both off the field and on it. There has been no vision from those at the hierarchy of the club and this factor has impacted their appointments of managers, who have failed to establish a proper philosophy at Old Trafford. However, under Ole Gunnar Solskjaer, this has quickly changed. The side now has a clear blueprint of how to act on the field and the Norwegian has made it clear to fans as to which players fit his system better than others. 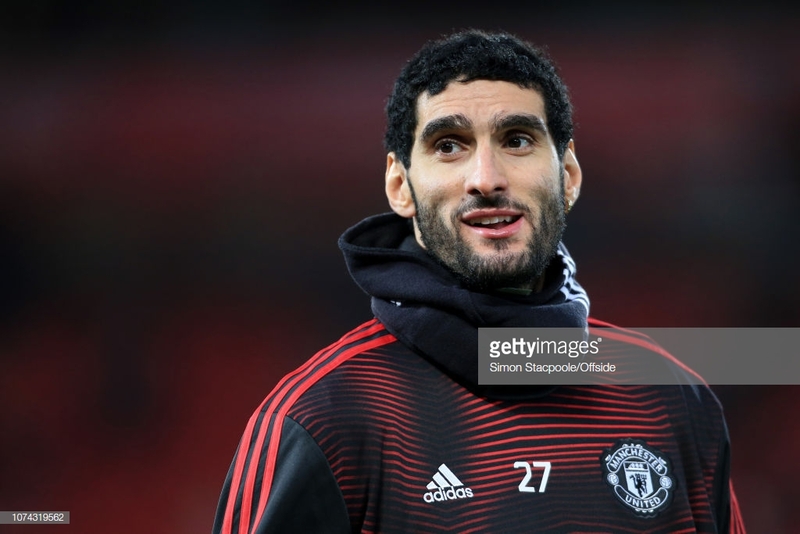 Fellaini has been one of the victims that has rarely featured under Solskjaer, as the caretaker manager appears to prefer the more technical options in this area. Paul Pogba, Ander Herrera, Juan Mata and Jesse Lingard have all predominantly found themselves ahead in the pecking order, and it is no surprise to see why either. Each of the aforementioned names all prefer to operate with the ball at their feet and even when not in position, each midfielder enjoys to find space with their fluid movement off the ball. From Fellaini’s perspective, this is not where his strengths lie. The Belgian’s departure could simply be down to the fact that he is not part of the football vision being implanted by Solskjaer at this current time – this should, therefore, lead onto further exits at the club. It would be a fair assessment in saying that if Fellaini is being shipped out, there are other players that should be sweating over their position at the club. Fringe players like Matteo Darmian and Marcos Rojo need to be cleared off the club’s wage bill, as neither player ever seems to feature for the club on a consistent basis. From the philosophy’s point of view, this could also see Antonio Valencia leave the club after ten years of being a Red Devil. The Ecuadorian has been a great servant to the club, but he can no longer fulfil the duty of the modern-day full-back. Solskjaer’s gameplan revolves around quick and agile players down the flanks, so fresh competition should be brought in to challenge the likes of Luke Shaw and Diogo Dalot. Many fans have also been arguing this case for Mata too, with Lingard looking the stronger asset in the false nine position. United have not been ruthless with their sales in recent years, but it is time to cut the sentimentalism. The club currently possesses a manager with a vision that is proving successful, and they should be removing any player that doesn’t fit the Norwegian’s system. Manchester City and Liverpool have shown exactly how efficient such behaviour in the transfer windows can be, so it is time for United to make a stand.